Today I’ll just mention a few things that have made me glad this week. 1) I’ve been waiting and waiting for a certain echinac ea plant to start blooming. It is later than the purple coneflowers nearby, and I was expecting it to be the orangey-brown variety that I bought last summer after I saw Kim’s on her blog. It opened up this week and it’s not – it’s white, which I don’t even remember planting. That one like Kim’s must not have made it through the winter. But I like white. 2) I found some dishes I liked at Target. I like the color and the design, and that they were on clearance, so I bought the salad plates. I don’t have a complete set of any dishes. For most of my life I’ve specialized in white dishes, and we often bought a dozen bowls or plates at a restaurant supply store. They have held up very well over the decades of children learning to wash dishes. White dinnerware makes the simplest meal, if it has a balance of colors, look very special. To have this many dishes that are more colorful in themselves is a new thing around here. 3) We had Mr. and Mrs. C. over last night to watch a movie. We also ate some apple pie that I made and served on my new plates, and I picked a few zinnias f or the table. I really did enjoy Elia Kazan’s “On the Waterfront.” It came out in 1954. Marlon Brando is great as the young man in the story, and the screenplay, as one reviewer said, is “impeccable.” There was an important part of the story about how Jesus is right there with you when you are at work in a dehumanizing job, and how He will help you to do the right thing. Those were the days! 4) I have alwa ys taken great satisfaction from doing laundry, especially my husband’s clothes. I even like ironing his shirts, but since he retired he wears more shirts that don’t need ironing, like the T-shirts I washed today. Folding and stacking these soft cotton knits freshly fluffed in the dryer makes it easy for me to be the Jolly Washerwoman. 5) Over 20 years ago we planted a rosemary bush next to our front sidewalk. Once or twice a year I prune it. Today I gave it a severe trimming and noticed how gnarly and thick the branches have become. I realized that even though it has some holes in its canopy, I’m not ready to replace it yet. It’s become an old friend. 6) I love succulents. I like sticking them into places that don’t get quite enough water to support most annuals. This afternoon I decided to do something about a bare spot that has showed up in the front yard, where the automatic misters for some reason don’t spray enough water. I dug up some of the red sedum from the back yard where it spreads like crazy, and put it in that spot with some granite rocks. Of course, I love granite rocks, too! 7) I love my robins. Yes, I was thrilled to discover that “he” is actually a pair of robins who have become frequent hoppers about the back garden. One day they sat on the fence facing each other having what seemed to be an intense discussion, or maybe they were just singing a jazzy duet. They were too shy to let me take their picture together, but I did get one of them on that fence. A couple of days later I found “him” again on the other side of the garden, still at a distance, but more cle arly silhouetted against the sky. Someday I hope to snap his picture on the birdbath, but I’m really glad to have this much success. 8) As I was planning this post I thought about how the many material things in our life can be thought of as having little value compared to the intangible realities like love and truth and kindness. But as soon as we are thankful for them, when we see them as gifts from our Father and receive a little bit of Him in them, they become threads connecting us to God, bringing grace in. And that’s the power of thankfulness. 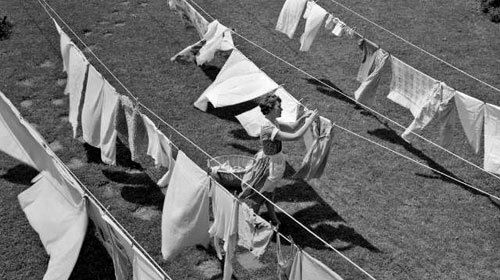 Lots of us homemakers, in the Northern Hemisphere anyway, are writing about laundry, as the summer sunshine makes it easy to use the fresh warm air to do part of the job. Cathy even posted a poem, which reminded me of my own favorite laundry poem. Funny, it’s from a man’s point of view, and written by a man who probably didn’t have too much direct experience, but maybe that’s why he could see not just the mundane and practical aspects, but the poetry and love of washing and drying the clothes of our fellow humans. Some are in smocks; but truly there they are.